A water footprint is a measure of how much water your business uses and which direct and indirect environmental impacts result from this. It can help you understand and manage your water use and even protect your company from physical, regulatory and reputation risks. How does it work? Freshwater is a scarce resource; its annual availability is limited and its local demand is growing. Water is unequally distributed, and humanity’s water footprint has exceeded sustainable levels in several areas. Water is a crucial resource for almost every business, from food to clothing to consumer products. As part of a life cycle assessment (LCA) approach, water footprinting has a lot to offer to companies: understanding your water footprint means understand where the water is being used, where its use can be reduced, and where the risks in the supply chain are. In this article, we will introduce water footprinting and why it is important. The second article in the series will explain the differences in water footprinting methods available in SimaPro. Water scarcity is quickly becoming one of the most important sources of stress on the environment and humans, causing an increase in diseases and malnutrition in communities and reducing biodiversity. By itself, this makes water use interesting for companies. Moreover, overuse and pollution of water can cause a large risk for your operations. Water footprinting is a risk management tool to assess physical risk (future problems with access), regulatory risks (unexpected water-related law or regulation may increase cost) and reputational risks (loss of customers or investors due to opinions about decisions about water resources and communities). Without a measuring the water footprint, it is difficult to know if your company may face a water-related risk. Furthermore, as we all know, you can’t manage what you can’t measure. How is a water footprint calculated? Most of us are familiar with the carbon footprint. Carbon emissions are a global issue; emissions of carbon (and carbon equivalents) all have the same impact on the atmosphere, no matter where they are emitted. Although this creates great complexity in policies, it is relatively simple to calculate the effect of these emissions with LCA. Each emission has a corresponding impact. Although a water footprint is similar, measuring Water Footprinting requires a different approach than carbon; it can be more complicated to calculate. Water is not an emission, but a resource, so we must consider both supply and regionality. The first step in calculating a water footprint is the inventory stage: add up the total volume of water used to produce a good in the supply chain. This provides valuable insight on its own, as it is important to understand how much water a product, process, or company consumes. The next step is impact assessment. What does using this much water mean? And what are the implications and impact of this? Water quality and water availability are the main considerations that need to be taken into account using impact assessment. Water is unequally distributed, meaning that using water in one area might be worse than using water in another area. In addition, water scarcity is driven by competition – the more water you use, the less there is left for others. Opinions differ on how best to take these considerations into account. 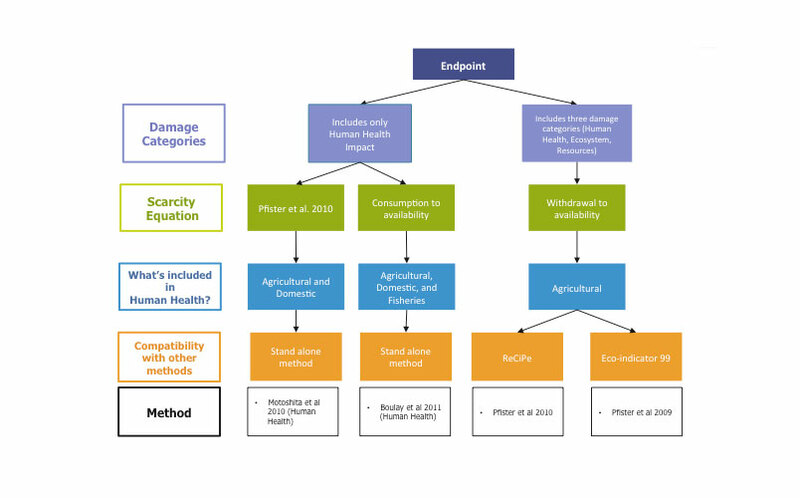 Therefore, while there is basically one accepted method for calculating a carbon footprint (IPCC GWP 2013), there are several methods for calculating a water footprint. Figure: Water footprinting in LCA, aldus the endpoint method. So, what are the different methods? For guidance on how to calculate a water footprint, ISO published ISO 14046: Water footprint: Principles, requirements, and Guidelines in August 2014. This is an international standard which defines the principles, requirements and guidelines for conducting an LCA-based water footprint for products, processes, or organizations. In SimaPro, 10 methods for measuring water footprinting are available. Since this can seem a bit overwhelming, the next article in this series will dive deeper into the differences between these methods. If you have any questions, please do not hesitate to contact Paula Bernstein. Read more about Water Footprinting in SimaPro. We can help you with developing custom LCA tools, tailored sustainability training and creating an effective sustainability strategy. Contact us to discuss your needs. Receive the latest updates on the field of LCA and developments in SimaPro. You will receive the newsletters from PRé Sustainability, developer of SimaPro LCA Software.